Products + Places We Love! Oh hey. Do you remember this blog? Yeah, neither do we. Took an unintentional hiatus. I vacationed all summer long, and actually, all fall/winter too. Been to Chicago, Black Butte, Lincoln City, Santa Barbara, Tucson, San Francisco, and Las Vegas all in the last 6 months. That is nuts – Illinois, Oregon x2, California x2, Arizona, and Nevada. And I started coaching CrossFit at my fav place, NWCF. And I still have the two kids to care for, obviously. Anyways, you get the point. Buuuut, as Evan and I sat in our friend Jamie’s kitchen on New Year’s Eve, we resolved to post again. Because we love this blog, and we love all of you for your support. And your graciousness while we peaced out for a few. So, here we go. Our absolute favorite breakfast. I cut out grains completely from my kids diet a couple of months ago. Prior to that, they hadn’t been eating gluten but were still eating lots of corn/rice. Their fav breakfast was “milk and munch” – the Nature’s Organic Gorilla Munch cereal. So I was worried about breaking that habit and doing something grain free for when they wake up and come downstairs with those adorable sleepy eyes and hungry tummies. 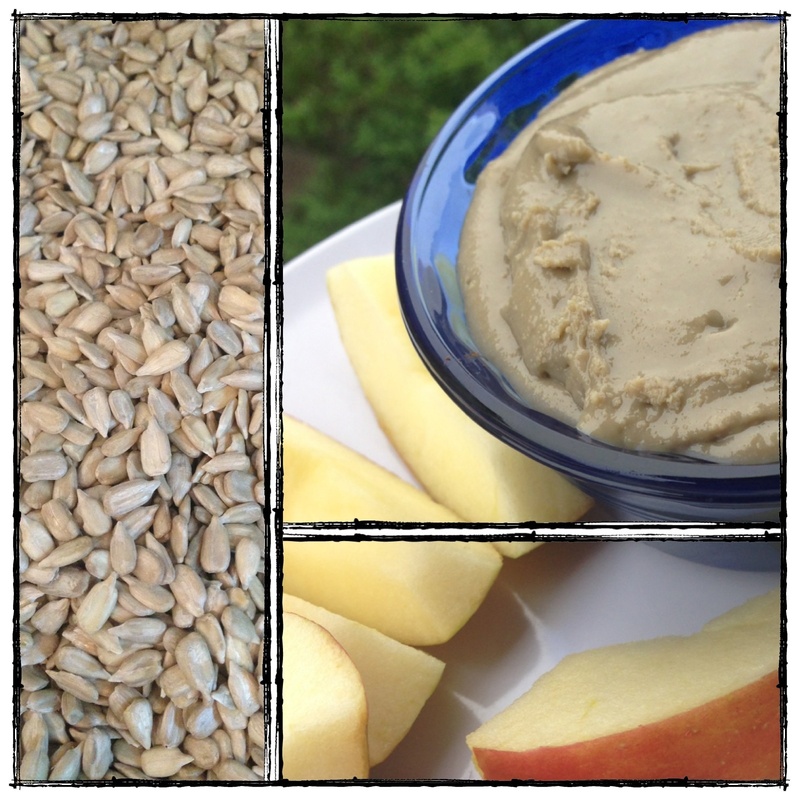 My dear friend Sarah who also cooks grain free for her family of 5 came to the rescue with this recipe. The 1st day was a bit rough, but starting with day 2, and everyday since, my kids don’t mention the munch and come down asking for ‘milk and seeds”. Is it a bit more work for me? Sure, but totally worth it in my opinion. I’ll post more later on why we finally cut grains, and the amazing health benefits we’ve seen as a result. The kids like to eat their seeds with their fingers, and sometimes in a bowl with milk poured over it. I like it best with a little yogurt and some berries on top. Added benefit – your house will smell divine while these guys are toasting. Enjoy, friends! In a large skillet, melt butter over medium heat. While butter is melting, lay a sheet of parchment paper on the counter. 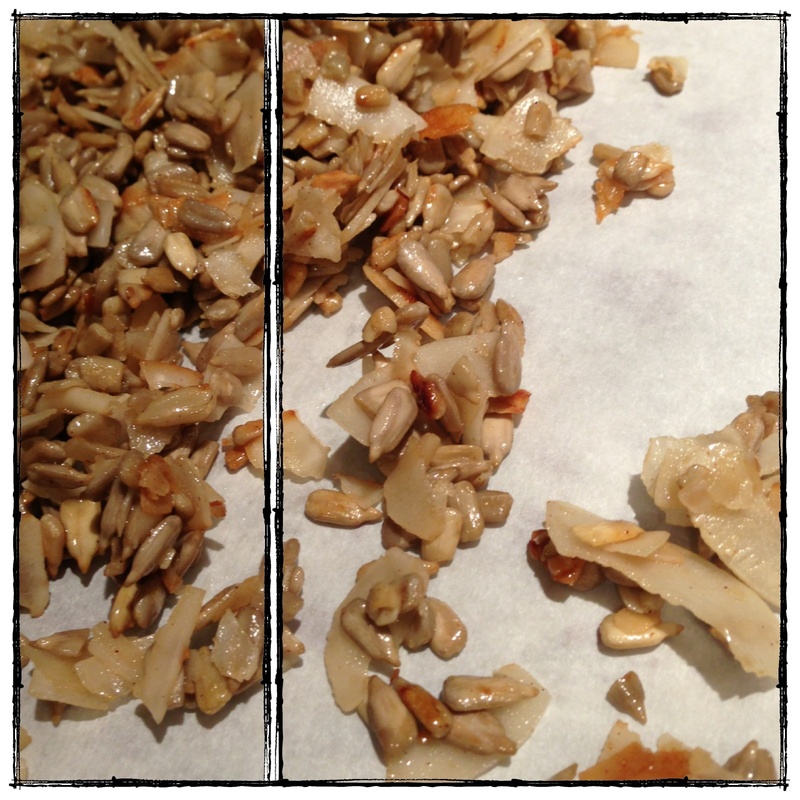 Add nuts, seeds, and coconut. Stir until butter coats the mixture. Add cinnamon, nutmeg, and cloves. Stir to combine. Add syrup and continue to stir until mixture is lightly toasted. Once desired toastyness is reached, quickly spread mixture out onto parchment paper. Because of the syrup, this will burn quickly so make sure to get it off the heat as soon as you deem it to be done. Allow the mixture to cool. It will crisp up as it cools – we usually wait about 15 minutes. Store in airtight container for up to a week. NOTE: You can use any variety of nuts and seeds, too. We’ve made it with pumpkin seeds, cashews, and walnuts. And sometimes we go crazy and add in some raisins or dried apricot after the mixture cools. Enjoy! *Use organic ingredients whenever possible. Posts may contain affiliate links. If you purchase products through an affiliate link, your cost will be the same but Flax + Honey will receive a small commission. This helps in covering the costs to keep the site up and running. We appreciate your support!! It was a beautiful and hot summer here in Seattle… and fall has officially arrived! And these little treats are perfection!! Best part for me is that they are quick and easy, and don’t even require baking. All you need is a food processor, Vitamix, or your favorite chopper-upper and you’re good! These keep beautifully in the fridge and then you have a cool treat packed full of yummy, good-for-you ingredients! These make about 12-16 balls or an 8×8 dish of Lara-type bars. Enjoy, friends! They are delicious and a big hit with the little ones, too. Put pecans, almonds and walnuts in the food processor and pulse until the nuts are coarse meal consistency. Add the pitted dates, dried apple rings, cinnamon, nutmeg, chia seeds, and salt to the ground nuts and pulse until everything is thoroughly combined and processed. The mixture should be sticky enough to roll into balls OR you can form them into Larabars: line an 8×8 dish with parchment paper, plop your mixture into the dish and smooth and flatten with your hand to shape the bars flat, refrigerate for a couple of hours and then cut into bars/squares once they’ve firmed up enough. 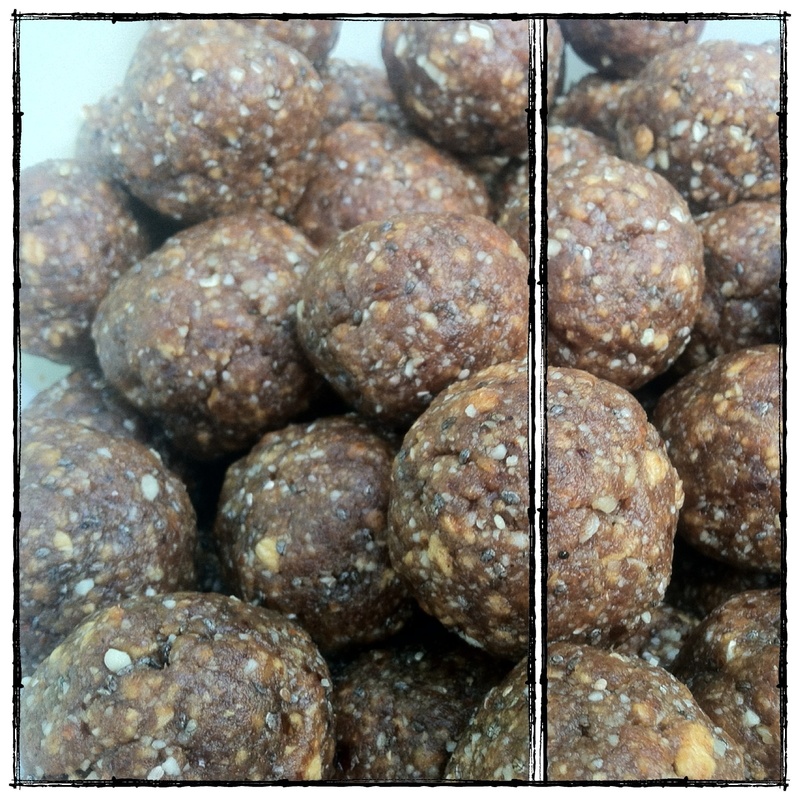 Once formed into balls or squares, they should be kept in a covered container in the fridge. **Adapted from Mind Body Green. I’m about to change your life. I’m serious. This cake is like the holy grail of grain-free cake eating. I was just telling my cousin Kellen about it, and I literally told her it was the best cake of my life at least 15 times. She practically hung up on me because I was so annoying about it. I deserved that. Anywhoooooo. The cake. So it is like the perfect base for whatever frosting your little heart desires. I’ve made it 5 times since my daughter’s birthday which was less than one month ago… I’ve done strawberry, lemon, coconut, chocolate, and maple frosting… and they were all so good. This is your basic yellow cake recipe, ready to adapt to whatever you had in mind. 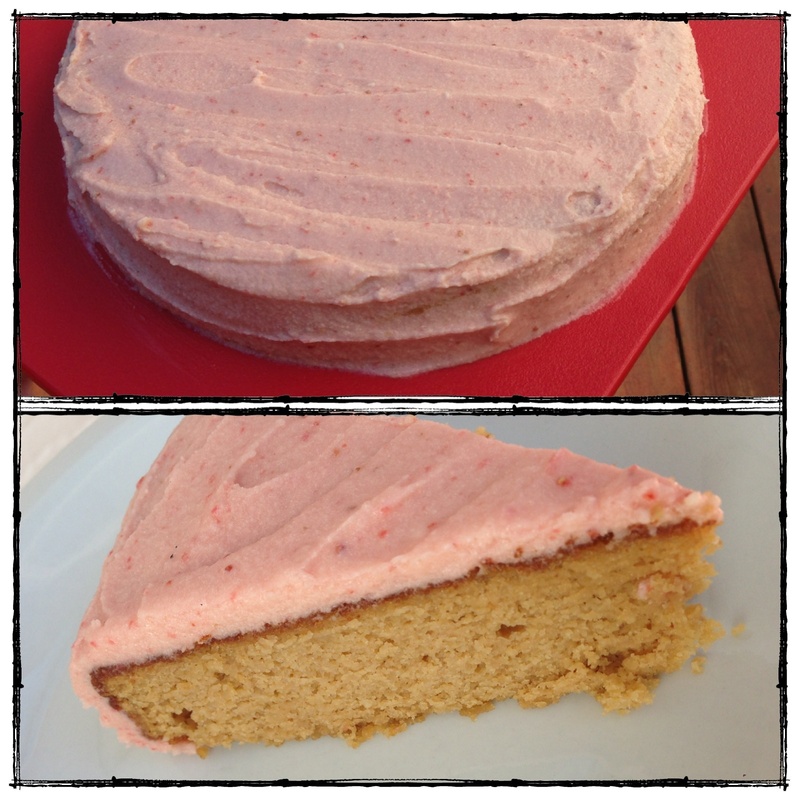 My awesome friend Sarah helped test the recipe, doubled it, and made a layer cake with frosting in the middle…. um, hello. Yes please. And as my BFF/cousin Kellen would say, I’d take that to the face… in a heartbeat. What are you waiting for? Make it, eat it, and let us know what you think!! PS, it is pictured below with strawberry frosting, obvi. And do you even see the texture? I’m telling you……. amaze-balls. Whisk together eggs, cream, vanilla extract, and coconut sugar. In a separate bowl combine almond flour, coconut flour, salt, and baking soda and mix until combined. Mix dry ingredients into wet using a stand mixer. I mix for about one minute on medium speed. Grease the bottom and sides of an 8×8 square or round baking dish and pour batter into dish. I use Kerrygold Butter – Unsalted to grease. Allow to cool for one hour before topping with the frosting of your choice. Might I suggest this chocolate frosting or this maple frosting? Enjoy, friends! Last week I had the privilege of spending the better part of a week with some amazing friends in beautiful Black Butte, OR. I when I say amazing, I mean it. You guys, as I was getting ready to drive 350 miles alone with two crazy toddlers, I got a text message from my friend Sarah that said “Drive safe. Pork tenderloin, grilled asparagus, salad, and a glass of wine will be ready for you when you arrive.” Amazing. Like, really. And, on top of that, they opened up their family vacation home to us and loved us like we were their own. Sarah’s parents, Nana Elaine and Papa Phil as the kids affectionately called them, treated my babies like their own grandkids and were generous, thoughtful, and kind. And the food. So good! We all pretty much eat the same grain-free, dairy-free, gluten-free diet… so vacationing with them made food stuff a breeze. A lot of times after vacation, I feel the need for a cleanse. Time to start again after weeks of eating crap. Not this time! Felt great the whole time… lots of fruits, veggies, eggs, and high quality protein. And then there was cobbler. Nana Elaine and Papa Phil tag teamed this delicious cobbler. We all waited late into the evening for it to finish baking, and it was well worth the wait. The day after I got home, I emailed Elaine for her recipe, and now I get to share it with you! I’ve made it 3 times since I’ve been home. Hope you all like it, too. PS, did I mention this is the best summer of my life? For a lot of reasons, but mostly because of the beach. And fires by the beach. And wine by the fires by the beach. And people I love while I drink wine by the fires by the beach. K. That is all. Gently toss sliced peaches in vanilla and lemon juice. Pour into 9×9 baking dish. In another bowl, combine the almond flour, pecans, coconut, cinnamon, nutmeg, and salt. Stir until combined. In a saucepan, over low heat, melt either your butter or coconut oil. Stir in maple syrup. Pour the syrup mixture into the bowl with the dry ingredients and stir until thoroughly mixed and crumbly. Pour topping onto peaches and spread until it covers the peaches evenly. 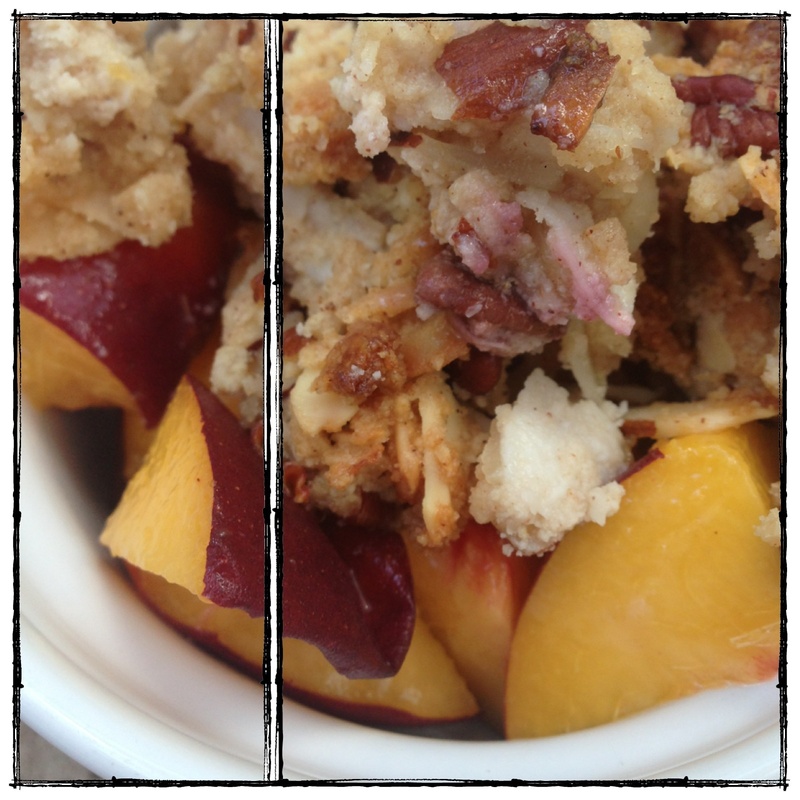 Bake in 375 degree oven for 25 minutes, or until peaches are soft and topping is golden brown. Enjoy. Also, be creative! Use other fruits! I added blueberries and raspberries the other night. Bomb. Prior to May, I had made waffles twice. And they were not good. 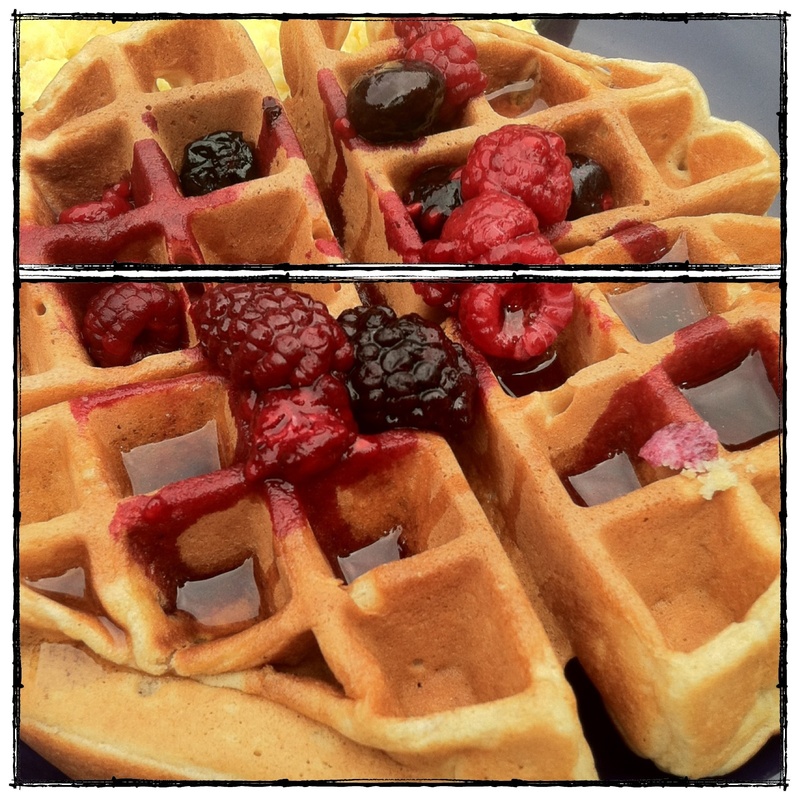 But in May, I volunteered to make waffles for my son’s Staff Appreciation Breakfast at his elementary school. Husband thought I was crazy. My awesome neighbor Julie (who was also on the committee) came to the rescue with this recipe. It is a favorite in her family. So I tried it out on my family, who loved it, and set out to multiply this recipe by 8 and serve to the staff. It worked! And it was so much fun! So much so that we made them again in bulk just a few days later for my 4 year-old’s birthday party. I double this recipe every time I make these. We have a really deep Belgian waffle iron and it uses a ton of batter, so I don’t get as many per batch. These freeze beautifully! You can take them out as needed and pop them in your toaster for a quick breakfast. Also, another lunch box favorite. Jonah loves these sandwich style with peanut-butter and honey in the middle. Yum. Enjoy! Mix the dry ingredients together. Beat the eggs, stir in the milk, vanilla, melted butter and honey. Add wet ingredients to dry ingredients and mix well. Pour batter on to your waffle iron (mine is a super deep Belgian iron and takes about 1/2 cup of batter) and cook until golden brown. Add some butter, 100% pure maple syrup, fruit and enjoy! Ohhhhhh man. We have been busy. Busy doing all kinds of things except for cooking and blogging…. we have been in the sun, at the beach, on airplanes, hanging with family, at multiple parks a day, having playdates, and really, really loving summertime in the great PNW. I don’t care what anyone says, this city is the best place to live in the summertime. Our sincere apologies, we will try to post more frequently! And we hope you all are enjoying time with family in the sun as much as well are! So this recipe is really simple, and soooooo delicious. One of my fav CrossFit coaches (Megan!) introduced this to me and we make it all the time. It is one of our go-to picnic items – slice a few apples and grab the mason jar filled of sunbutter and we are good to go. Even if you’ve never tried sunbutter, make this and give it a try. Sunflower seeds are soooo cheap, too. We get a bag of raw sunflower seeds at TJ’s for just over $1. Can’t be that. Oh, and PS. Today I PR’d my Grace time by 40 seconds. 3:08 baby! Next stop, sub 3:00. Hopefully. I realize that means nothing to a lot of you, but my CrossFitters will know what I’m talking about… Who doesn’t love a good benchmark WOD? Lightly toast your sunflower seeds. I do this in a frying pan over low heat for about 5 minutes, or until they are slightly golden. You don’t want to overdo this step, but a little toasty flavor makes for a better sunbutter. Transfer seeds to food processor with blade in place. Toss in the sea salt. Put the lid on, and turn that baby on. You are going to run it for about 10 minutes…. Let it go for about 5 minutes. It will start out powdery, then the seeds will release a bit of their oils and it will be a little moist. Give it a stir, add the honey, then keep going. You don’t want to add the olive oil until the very end. If you let it go long enough, the seeds will release their own oils and it will be almost perfect. Just a little olive oil will make it slightly thinner. But if you get impatient and add olive oil too early, the seeds won’t release their own oils and your end product will be really chunky and gross. After 10 minutes, drizzle olive oil in while food processor is still running, until it reaches desired consistency. Easy. Two things: The blog I adapted this recipe from has an amazing picture tutorial, so be sure to check that out for additional information. And, I know some of you will be cautious of running your food processor for that long. I’ve made sunbutter at least 10 times in the last few months and my food processor has handled it no problem. Just FYI. Enjoy! **Adapted from The Prudent Baby. All of this sunshine in Seattle has done atrocious things to my meal-planning and my dinner-making. I have been scrounging through the fridge and pantry around 4:30 every afternoon practically demanding things to appear out of thin air. We have had some pretty pathetic dinners at our house the past couple of weeks. The kids and I haven’t been able to bring ourselves in out of the sunshine. It’s simply magnetic to us Seattle-ites. 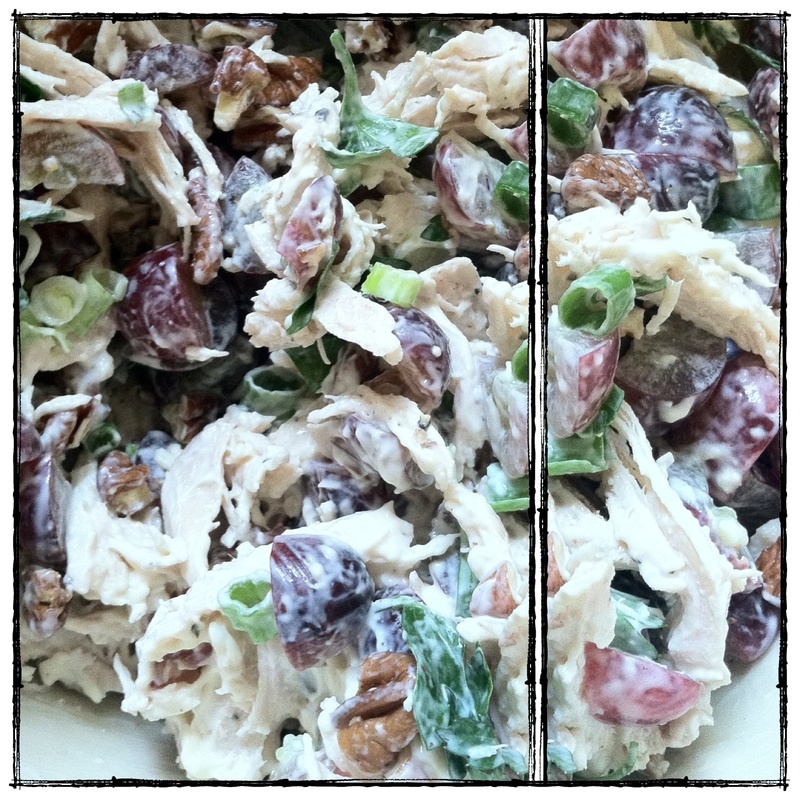 This chicken salad has been in my sunny day repertoire for a really long time. I’m not sure where it came from and I’m sure random things get added in to the mix, so the recipe is super duper flexible. Such as, I cook my chicken with the celery stalks, but I do not put celery in my chicken salad because I have a strong dislike for celery in things… but you, dear reader, may add celery to yours! And whatever else you’d like, for that matter. I hope it comes in handy and saves you from the sunny-day-scramble-for-dinner blues. In a large pot half-way filled with water add your chicken breasts and celery stalks, salt and pepper and bring to a boil. Once water is boiling, lower heat to medium low and let chicken simmer 30 minutes to an hour. Remove chicken and let it cool. Once it has cooled to touch, shred with a fork (or in your mixer with paddle attachment in place) and place in a medium-sized bowl with chopped parsley, grapes, pecans, green onion, and mayo. Mix it all together and taste and add salt and pepper accordingly, and possibly add more mayo or sour cream if the mixture doesn’t seem wet enough for your taste.